Monkeys have been able to control robotic limbs using only their thoughts, scientists report. The animals were able to feed themselves using prosthetic arms, which were controlled by brain activity. Small probes, the width of a human hair, were inserted into the monkeys' primary motor cortex - the region of the brain that controls movement. Writing in Nature journal, the authors said their work could eventually help amputees and people who are paralysed. Lead researcher Dr Andrew Schwartz, who is based at the University of Pittsburgh School of Medicine, said: "We are beginning to understand how the brain works using brain-machine interface technology. "The more we understand about the brain, the better we'll be able to treat a wide range of brain disorders, everything from Parkinson's disease and paralysis to, eventually, Alzheimer's disease and perhaps even mental illness." 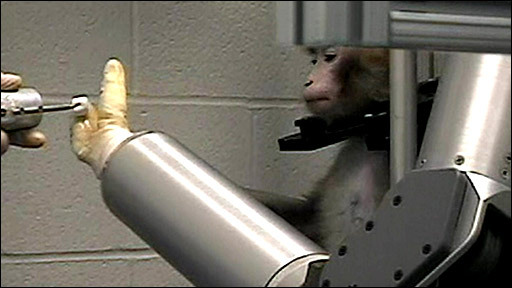 With the probes inserted into the monkeys' motor cortices, computer software was used to interpret the brain's electrical impulses and translate them into movement through the robotic arm. This arm was jointed like a human arm and possessed a "gripper" that mimics a hand. we've demonstrated a higher level of precision, skill and learning. After some training, two monkeys - who had had their own arms restrained - were able to use the prosthetic limbs to feed themselves with marshmallows and chunks of fruit. The researchers said that the movements were fluid and natural. The monkeys were able to use their brains to continuously change the speed and direction of the arm and the gripper, suggesting that the monkeys had come to regard the robotic arm as a part of their own bodies. The success rate of the experiment was 61%. Dr Schwarz said: "In our research, we've demonstrated a higher level of precision, skill and learning. "The monkey learns by first observing the movement, which activates its brain cells as if it was doing it. It's a lot like sports training, where trainers have athletes first imagine that they are performing the movements they desire." He said the research could eventually benefit the development of prosthetic limbs for people with spinal cord injuries or for amputees. He said: "Our immediate goal is to make a prosthetic device for people with total paralysis." "Ultimately, our goal is to better understand brain complexity." Commenting on the paper, Professor Paul M Matthew from the Hammersmith Hospital, said: "The challenge of interfacing the billions of nerve cells in the brain that control the full range of limb movements directly with a mechanical prosthesis has seemed impossibly difficult. "However, this important paper confirms that the brain controls movement just by planning where to go, rather than by directing individual muscles how to make the limb get there. "The study shows that fewer than 100 tiny electrical signals generated in the specialised area known as the 'motor cortex' can command even complex arm and hand movements. "This moves the day when patients disabled after spinal cord injuries or amputations can use brain-controlled bionic limbs from the realm of science fiction towards science fact."